When it was announced late last year that actor Haaz Sleiman would not be returning as gay nurse Mo-Mo in Nurse Jackie’s sophomore season, fans of the Showtime series feared the surprise departure signaled a “code blue” for gay content. 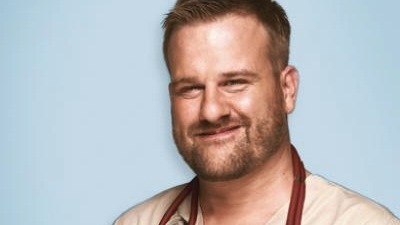 Skeptics can safely swallow a chill pill: Stephen Wallem, who played peripheral gay nurse Thor last season, has been promoted to a regular. A professional stage actor for almost 25 years and a fixture of Chicago’s cabaret scene, Wallem, who now lives in New York, discusses his very personal connection to the part — and why his lesbian sister had something and nothing to do with it. Advocate.com: You and Nurse Jackie writer, cocreator, and co–executive producer Linda Wallem share the same last name. Stephen Wallem: Yes, how about that? Linda is my big sister, and this is the first time we’ve worked together professionally. And both you and Linda are openly gay. Yes, we’re very close, and we were both been blessed with the most supportive family to come out to. We also have an older brother who’s straight, so my mom got grandchildren out of it, thank God. [Laughs] We also had a gay uncle, my mom’s brother, who we lost a couple years ago. He had a huge influence on Linda and me, both artistically and personally. He was a playwright, so he instilled both of us with a love of theater and classic movies. He was with his partner for over 30 years, so we grew up seeing a rock-solid gay marriage between Uncle Jim and Ken even before we understood what that meant. That was wonderful for us to see, but it also raised our standards really high. Were you lucky enough to not have to audition for Thor? No, I went through the same audition process as everybody else did. As much as Linda would love to have final say on everything, that’s not the way it works with a project like this. She got me in the door for the very first audition, but after that I was on my own. When you’re dealing with a family member in this kind of situation, you almost have to prove yourself even more. If it were really up to her, I would’ve had a bigger role last season. Now that Jackie’s gay confidant, Mo-Mo, is gone, how would you describe Jackie’s relationship with Thor? Jackie is more of Thor’s confidant because she mainly helps him with his problems. Thor was more intimidated by Jackie in season 1, but he really dug her and wished they could be better friends. That starts to happen this season after Thor, who’s diabetic, has an insulin reaction during work, and I welcome the opportunity with open arms because Edie Falco is the best. I crave and am grateful for any second I get with her on-screen. Many viewers have expressed concern that losing Haaz Sleiman’s gay nurse, Mo-Mo, would mean a significantly straighter direction for Nurse Jackie. It’s been so interesting to read the Internet and see the public’s relation to changes on the show. People have jumped to a lot of conclusions and made these assumptions even before season 2 has aired. Just because Mo-Mo is gone, people immediately thought, Oh, they’re cutting back on gay story lines. That’s absolutely not true at all. So what’s the inside scoop on Haaz’s departure? Were you being a diva and demanding to be the only gay nurse on duty? [Laughs] Yeah, call up anyone on the show and ask what a diva I am — I’m so far from that! It really had nothing to do with me, so that’s been another shocking assumption. I read on a pretty major news site where a columnist said it was somehow demanded that Thor become the new Mo-Mo, which is ludicrous and just plain untrue. I’m not privy to the reasons behind that decision, but I know I had nothing to do with it. Why do you think Nurse Jackie steadily continues to be such a gay-inclusive series? Is it simply because your sister and other executive producers Liz Brixius and Richie Jackson are gay, as is Showtime entertainment president Bob Greenblatt? That might be part of it, and having gay creators does make a difference, but it wasn’t their main goal to make gay characters a priority and include as many gay story lines possible. It just evolved that way naturally, because — guess what? — there are a lot of gay people in real life and in every kind of work situation. It’s about time that’s shown on television, and I’m very proud to be part of a show where the fact that some characters are gay isn’t even an issue. What was it like to work with Harvey Fierstein, who guest-stars this season as the husband of a dying patient? I have just one line with Harvey, but he could not have been lovelier to work with. In reference to his character being married to a man, I say to him, “Thank you for paving the way.” But after about two or three takes, it hit me like a ton of bricks that I had just been given the opportunity to thank Harvey Fierstein himself for being a pioneer. Being able to look into that amazing man’s eyes and thank him on film was sort of an indescribable honor. Tell me about this season’s exploration of Thor’s diabetes, a disease from which you also suffer. Before they started writing season 2, Linda came to me and said they were thinking about adding that part of my life to Thor’s story line. She double-checked with me because she didn’t want to delve into anything I wasn’t comfortable with. I was terrified, honored, and excited all at once. Ultimately, I did want to explore that because there are so few diabetic characters on TV and in film. It’s very frustrating when you have the disease because most people don’t understand the severity of it, so this felt like an amazing opportunity to help expose people to diabetes and how serious it is without being preachy. If I can make any other diabetic feel a little less alone, it’s worth it. Like Thor, you’ve lost an eye to the disease, and in an upcoming episode you actually remove your eyepiece. Yeah, that was probably the strangest day of my professional life. It was also sort of funny because we quickly learned after everyone read the script that most people on the show didn’t know I really had an eyepiece. The makeup department contacted Linda and said, “How do you want us to make this piece? Is this going to be computer generated?” She’s like, “No, he’s actually going to be taking out his eyepiece and showing it. This is real.” I did a whole cabaret show about my experience with diabetes, but the idea of millions of people watching me on television as I literally expose the most vulnerable part of myself was absolutely terrifying. But everyone took special care to make sure I felt comfortable. Have any other aspects of your own personal life translated to Thor? I’ve also struggled with my weight for my whole life. Linda and I have a long-running joke: Whenever she asks what I feel like eating, my go-to response has always been “wedding cake.” Unfortunately, I have the hugest sweet tooth for someone who shouldn’t be eating anything sweet. We know that Thor has a new boyfriend. Will he ever be introduced? We don’t get to see that in season 2, and I have no idea what’s going to happen in season 3. It’s not up to me, of course, but I think it’s important to show gay characters in stable relationships, and I would definitely welcome it if the writers chose to explore that. If you could choose, whom would you cast as Thor’s boyfriend? I like to think that Thor would have a boyfriend that his friends and family wouldn’t necessarily pair him with, so I hope it would be someone quirky. I like surprises and unpredictable characters. We keep hearing about so many big-name actors who are huge fans and really want to be on the show, so it’s anybody’s guess who’ll show up on the set next. Yes, we just celebrated our one-year anniversary, and this was about eight years after my last relationship. He’s a theater professor. We have about 100 mutual friends and had met a few times back in Chicago about 12 years ago. We reconnected again thanks to Facebook and started chatting as friends. Before either one of us knew it, we were in love. It’s pretty much the best thing that’s ever happened to me. You’re celebrated in Chicago for your autobiographical one-man cabaret shows. Have you always been out professionally? I never took the path of pretending I was something I wasn’t, but I also didn’t make a big deal out of it because, as I’ve said, my coming-out process wasn’t traumatic and being openly gay wasn’t really a struggle for me. If I sang love songs to a man that were gender-specific, it was just sort of a given and I didn’t make an issue out of it. I never really thought about it because you don’t really have to worry about being gay as a stage actor. I never dreamed in a million years that I’d be on a TV show, but here I am, playing a role that also happens to be gay. But that’s just one aspect of the role, and I approach every role with objectivity. The fact that I happen to be gay certainly helps contribute to the role, but it’s not a given that it’s going to feel authentic just because I’m gay too. Now that you’ve made the transition to television, do you have any concerns about being openly gay? I had trepidations before the show aired for the first season because this is my first exposure of this magnitude and it’s as a gay man. Having done theater my entire life, where I’ve played a huge variety of roles, the last thing I want is to be typecast. Doing this show for two seasons, I’m starting to understand how people in the industry focus on what they’re used to seeing you doing. They don’t care about your past or potential; they just know you can play a gay man, so they offer you another gay role. I have no control over that, and you have to trust your agents. I’ve had my handful of wacky gay hotel managers, but I’ve also been sent out on auditions for an equal amount of straight roles. You just have to keep your fingers crossed and hope that casting directors keep an open mind. I’ve noticed online that you have quite the bear following. Yep, and I didn’t see that coming at all. [Laughs] I’m a bigger guy for sure, but I’ve never considered myself a bear per se. Then I started wearing a beard, and I guess a big guy with a beard is automatically labeled a bear. But I’ve gotten nothing but wonderful, kind words from them, so I’m absolutely delighted by it. If I had to pick any part of the gay community to embrace me, I’d pick the bear community because they’re the most accepting and nonjudgmental. I love it.